After Chinese brands it was the turn of Indian brands to launch their new smartphone offerings on Monday. The Indian brand Ziox Mobiles launched their new smartphone the Ziox QUIQ Flash 4G. The Ziox QUIQ Flash 4G comes with Voice over LTE (VoLTE) and Video over LTE (ViLTE) support. The Ziox QUIQ Flash 4G sports a 5inch FWVGA resolution display that is encased in Dragontrail Glass for additional protection. The Ziox QUIQ Flash 4G runs Android Marshmallow with the help of a 1.3GHz quad-core processor and 1GB of RAM. The Ziox QUIQ Flash 4G has an internal memory of 8GB and a microSD card slot takes care of memory expansion. The Ziox QUIQ Flash 4G has a 5MP LED flash equipped camera on the rear and a 2MP camera on the front. The Ziox QUIQ Flash 4G also supports regional languages just like the recently launched Lephone W7. The Ziox QUIQ Flash 4G is powered by a 2450mAh battery that can last for up to a day on average use. The Ziox QUIQ Flash 4G comes with Wi-Fi, Bluetooth and microUSB connectivity. The Ziox QUIQ Flash 4G will be sold as a ShopClues exclusive. The Ziox QUIQ Flash 4G is already available for purchase at a discounted price of Rs. 4,444. 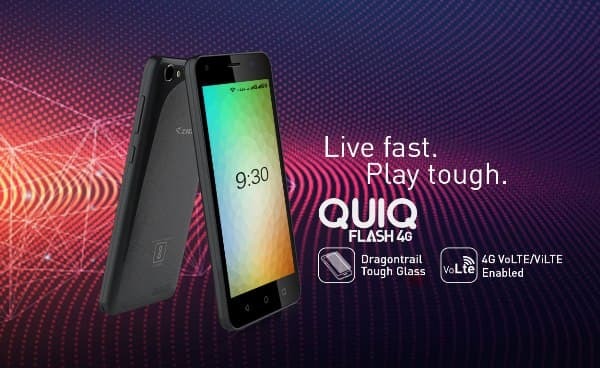 The Ziox QUIQ Flash 4G is being sold through a normal sale. You can get up to 10% cashback on Vodafone m-pesa and 5% cashback on Mobikwik if you purchase the smartphone on ShopClues.